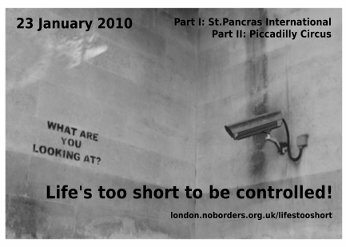 Urban Orienteer: NoBorders proposes a day out...out of control! Following my previous post on PHNAT's Mass Photo Gathering taking place tomorrow, I just discovered that London NoBorders will also be staging a further series of protests later that afternoon. The first is planned for 2pm at St. Pancras International. The second will take place at 4:30pm in Piccadilly Circus. The first protest concerns the new e-borders controls established their by the UK Border Agency. Closer to the current concerns of Urban Orienteer, the second protest is intended to raise awareness about the constant surveillance of unwitting commuters, shoppers and tourists passing through London's West End. Somewhere underneath Piccadilly Circus and the Trocadero lies a network of tunnels leading to the City of Westminster's CCTV Control Room. It was for this reason that pictures of Piccadilly and the Trocadero were used in the images produced for my current collaboration with Mark at Dancing Eye. Further information here. If you do happen to attend any of the events on Saturday, please feel free to let us know how you get on by commenting below.